Yes. I’m pretty sure the best Christmas trifle recipes layers are full of Pistachio pudding goodness like the recipe we’re sharing today. There seriously aren’t many things better than a trifle that is loaded with delicious ingredients that are both easily obtained and easily tossed together. If you’re looking for quick and easy Christmas recipes, desserts that you can make in less than 10 minutes, you’ve come to the right place. 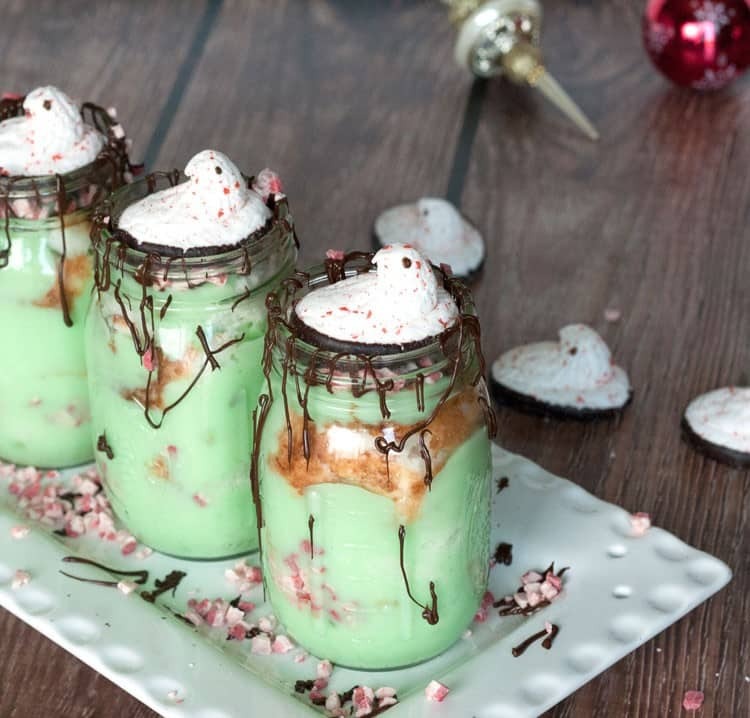 And hey, Christmas dessert recipes pictures that look so yummy will probably make you hungry enough to make this recipe up today. If pistachio isn’t your flavor, we have other trifle recipes you’ll want to taste test. Simple, easy ingredients. Jello pudding Pistachio Cake recipes are very low-key and take literally no skill in the kitchen to throw together. Our Pistachio Trifle is even easier than baking a cake! Take a pre-made angel food cake, some pudding, and a few other ingredients, and you’re good to go. If you’re a beginner in the kitchen, this is the perfect recipe for you! 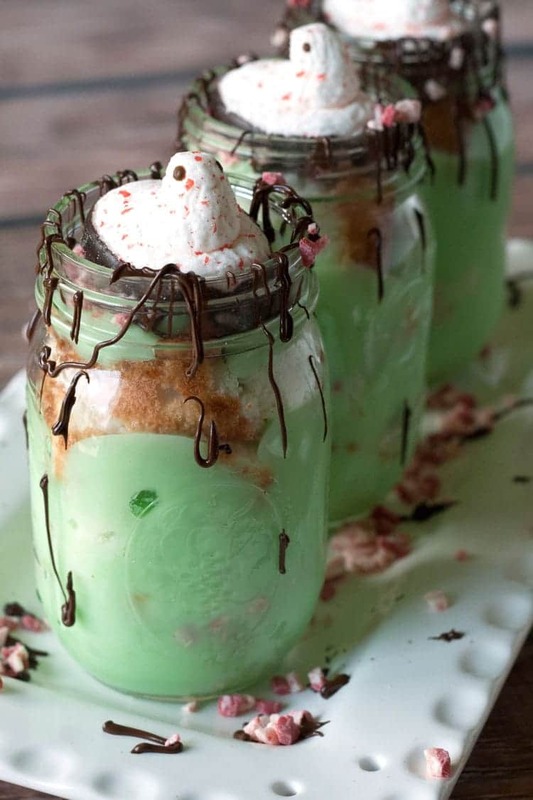 You can use some fun mason jars and make individual portion-size trifles, use mini tasting dishes if serving alongside other desserts, OR you can use a gorgeous trifle dish and make an awe-inspiring trifle that will have your guests oohing and ahh-ing. And, with what we think is the best Christmas trifle recipe, you’re sure to get rave reviews in the taste department too! Delicious. The best Christmas desserts are easy on the eyes and taste great too. I mean, lets get serious. No one wants to eat a dessert that doesn’t look good, right? My main concern when contemplating easy Christmas dessert recipes is finding ingredients to use that most people either have on hand, or that don’t cost an arm and a leg on a quick trip to the store. Throw in a few decorative PEEPS® Candy Cane Chicks Dipped in Chocolate, which could be easily substituted for other holiday candy, and we have a fun and festive presentation that looks almost too good to eat. Start a new holiday tradition this year. Christmas trifle recipes are the perfect answer to holiday dessert dilemmas. Don’t get me wrong. I love holiday baking and Christmas cookies are out of this world delicious–but, when it comes to desserts, my favorites are poke cakes and trifles. They are moist and decadent without being over the top on the time involved in making them. Which. Is. Awesome. So, yes. I will be trying a JELLO pudding pistachio cake recipe soon–only I will most likely turn it into a poke cake. In the mean time, I’ll be enjoying the best Christmas trifle recipe I’ve come up with to date. And by enjoying, I mean I’ll be savoring each and every last bite. Do you need to feed a crowd? Easy Christmas dessert recipes are the answer to that! If you have a crowd to feed, I’m guessing that time is probably going to be an issue, considering all the other dishes you likely have to make. Reduce your stress by selecting a dessert that is easy to make. All this one takes is the ability to mix pudding mix with milk and layer some ingredients together. Sounds simple enough, right? The best Christmas desserts are those you don’t have to stress over but that bring delight to those who get to enjoy them. 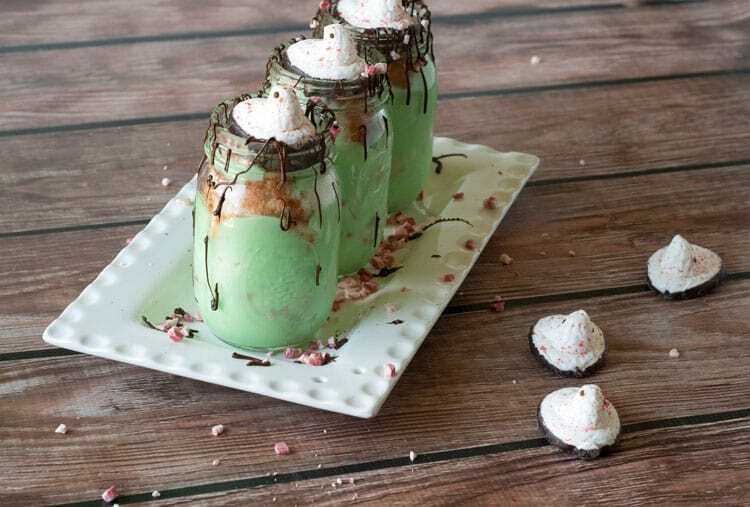 This is just one of several easy Christmas desserts recipes that I’m looking forward to making this holiday season. And since I have a few recipes I like to think of as best Christmas desserts, I’m thinking of serving them up in miniature tasting dishes so we can enjoy a taste of each without over-indulging at all. In a medium mixing bowl, whisk together pistachio pudding mix with milk for 1–2 minutes until well blended. Refrigerate for 5 minutes. 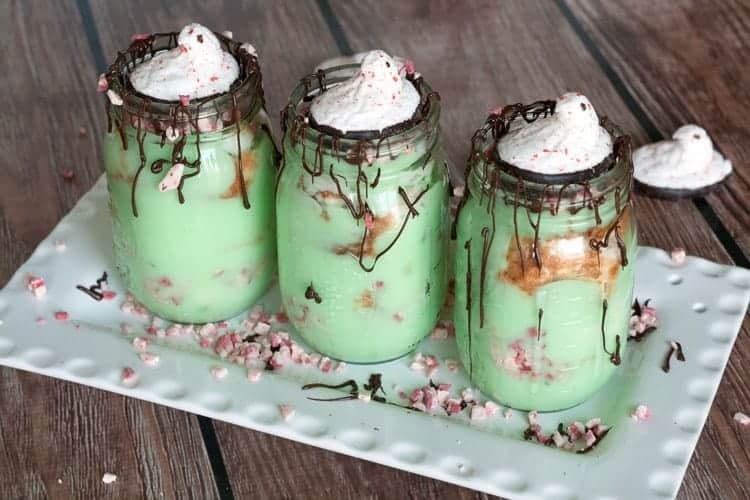 Using small dessert cups, layer the pudding, cake piece, and a sprinkle of peppermint chips. Repeat for a second layer. In a small glass microwave-safe bowl, melt the chocolate chips for 60 seconds, stir, and then continue melting at 30 second increments in the microwave until the chips are completely melted, stirring in between each additional 30 seconds. Drizzle over the top of the individual trifles. Sprinkle on any remaining peppermint chips. Top each trifle with a PEEPS® Chick. Serve immediately or cover with plastic wrap and chill in refrigerator. I am a sucker for pistachio anything. I’m also gluten-free and dairy-free so this recipe is probably a pipe dream for me but I’m such a fan I had to comment. Maybe there’s a way I could experiment and make it allergy-free for me without losing the star power so clearing displayed here. 😉 Maybe. I’m sure there would be a way to adapt this so you could try it out. Thanks so much for the huge compliments! Glad you like it. It was delicious! It really is easy. Simple recipes are always my favorite! OMG. This looks absolutely divine! I love pistachio anything… it’s right up there with pumpkin spice. This looks sooooo good. Why have I never had pistachio cake?!? Happy New Year and thanks for joining us again at Saucy Saturdays. 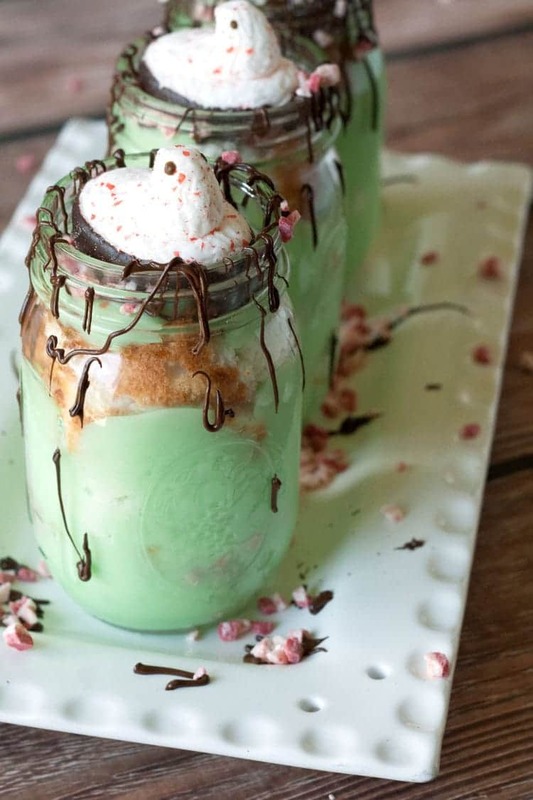 Pistachio trifle looks delicious, thanks for sharing with Hearth and soul blog hop, pinning.